Trying a Chicken 65 was not at all in my mind till my husband came and asked me to prepare this for his potluck party. I said many alternate recipes to him and finally I was not able to convince him and he won. Since my job here involves only marinating & frying, I somehow accepted to cook this dish. Without any prior experience, I tried making chicken 65 for a group of 20. Needless to say my first attempt turn out to be reasonably good. Just that I felt the coriander powder's taste a bit high. I got the same feedback from my colleague when I shared this dish with her. So, when I tried it next time for my blog, I divided the chicken quantity into two and for the first batch, I was very careful and added optimal quantity of coriander powder. I tried the other batch without coriander powder. Both the dish tasted good except a slight flavor change. 1) Wash the chicken pieces well and cut them into bite size pieces. Grind ginger and garlic to a smooth paste. 2) Take the chicken pieces in a large bowl. Add all the ingredients to the bowl except last four ingredients. Mix well. I added coriander powder to my stepwise pictures. you can also skip it. 3) Cover the bowl using a cling wrap and keep inside the refrigerator. Marinate it for 3-4 hours . I marinate it for over night. 4) After marinating it, Bring the chicken to room temperature and add corn flour. Mix well. 5) Heat oil in the kadai. 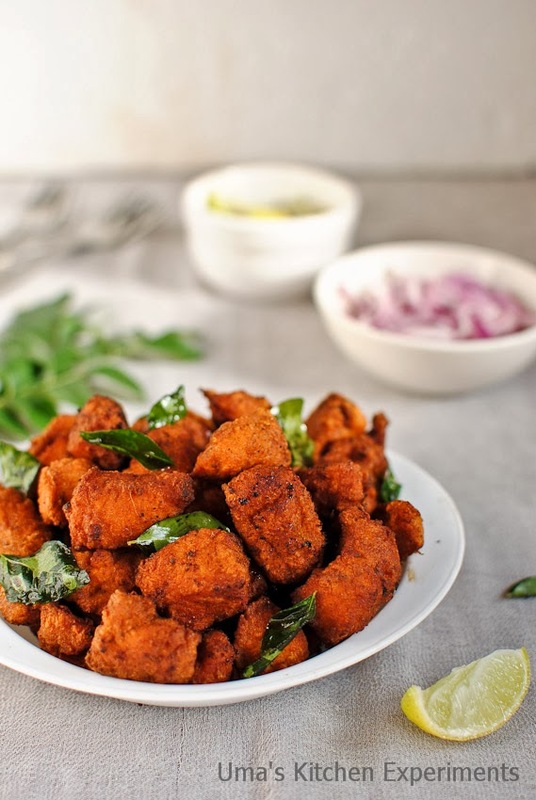 When it is hot and not smoking, add few pieces of chicken and fry till it turns crisp and darker in its colour. 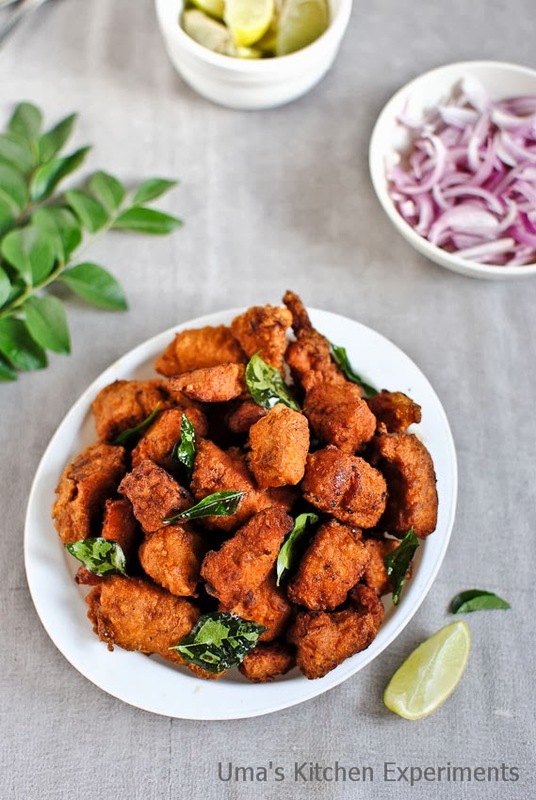 I usually use small quantity of oil and fry the chicken in small batches and discard the oil after the use. 6) Transfer the fried chicken to the kitchen towel the drain the excess oil. Once done, transfer to a bowl. 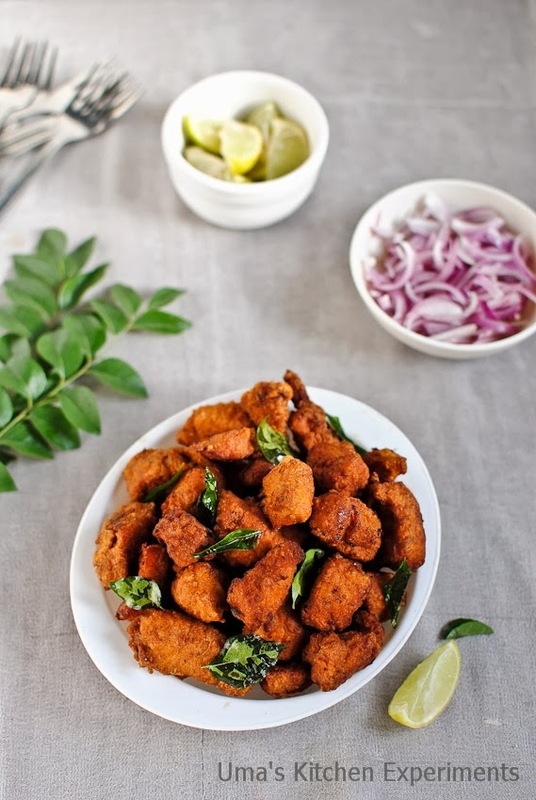 7) After frying all the chicken pieces, fry the curry leaves and add it to the fried chicken pieces. 8) Serve it with sliced onion and lemon wedges. 9) Tastes very good when served hot or warm. 1) I used kashmiri red chilli powder for the bright red colour and skipped the red food colour. You can use the same or go with our regular chilli powder and add pinch of red food colour. 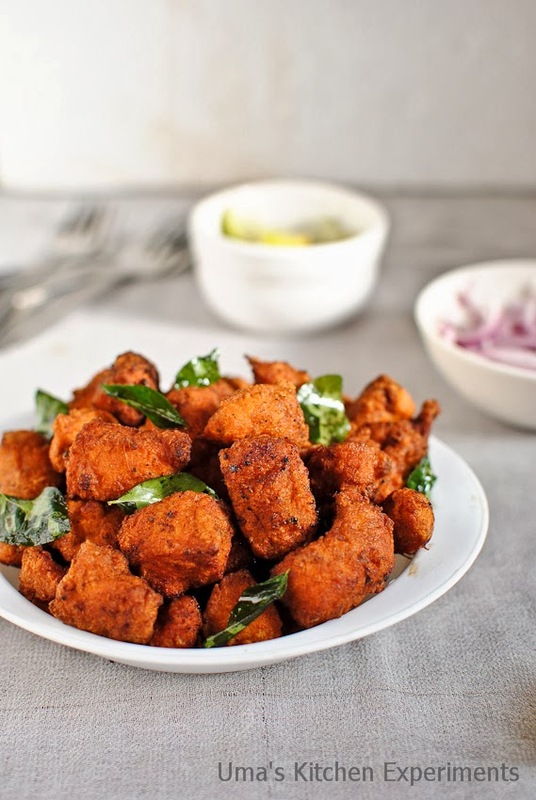 2) During my first attempt, I added equal quantity of red chilli powder and coriander powder and I felt the coriander powder taste was dominating. so, next time when I tried, I reduced it 1 teaspoon. It also tastes good without coriander powder. 3) Make sure not to over fry the chicken and once fried, do not leave the container open for long time in which chicken pieces are kept. This makes the chicken pieces hard and rubbery. 4) You can also use curd for marinating. Delicious chicken65!!! I love the way you made it!! super chicken 65,loved ur all clicks!! Super yummy and inviting! Wishing you a blessed New Year! Yum yum in me tum tum!!! !